We support both PC and Mac platform. A poster can be created with the following software applications PowerPoint, PDF, Illustrator, and Publisher. We accept files through email to the following bret.poster@vanderbilt.edu, CD or USB drive. See Pricing & Payment. a) The text boxes on your poster should not be overlapping. b) The information on your poster should not go beyond the top, bottom or outside margins to allow for variations in printing. Please used standard fonts like Arial or Times. Use of non-standard fonts or special characters could lead to missing characters after printing. Create a new blank PowerPoint layout presentation. Turn on gridelines to help line up your figures and text boxes. This will display horizontal and vertical lines on the blank presentation. 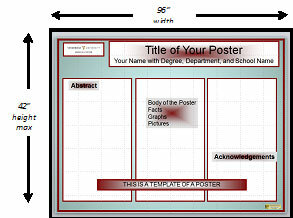 Note: See Advice & Tips for additional information on creating poster that print successfully.